The 'Force Secure Connections' feature allows you to specify that all future connections to a particular site are made over a secure HTTPS connection. You can also enforce HTTPS connectivity to sub-domains of the domain. When you visit a site over HTTPS, Comodo IceDragon will show a padlock icon on the *right* of the address bar. By default, the padlock is gray, meaning secure connections are not yet enforced. No additional actions will be performed if the page is loaded again. If you wish to disable forced secure connections, click 'Don't force HTTPS'. It's possible your credentials may still be posted to HTTPS once you click the 'Sign in' button, but the absence of a certificate on this page means you cannot verify the authenticity of the website. Furthermore, loading the sign-in page over HTTP also means you cannot verify the page's integrity - it may have been modified by a 3rd party before it loaded in your browser. 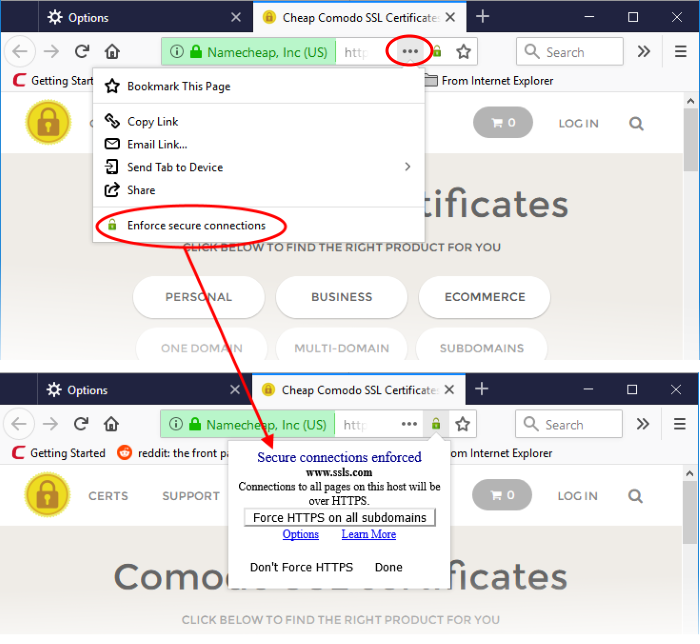 With a HTTPS connection, you can click the lock on the left of the address bar to view the website's SSL certificate. Apart from encrypting the information you submit and ensuring page integrity, the certificate also contains critical website identity information which allows you to verify that you are connected to the genuine Stylight website.